Hi DIYers! When many people think of a professional Honeywell Security System, they usually think of a top-of-the-line security system installed by a professional. Well the truth is you can install the system yourself. Thanks to Honeywell Home Security Systems, do it yourself is possible! You don't have to be a professional to install your own Honeywell Home Security System. In fact, with the right setup, you won't even need any tools! Okay, maybe you'll need a screwdriver to connect some wires. But that is not asking a lot. By following some simple instructions, you can install your own complete and professional set up on your own. The same equipment that the professionals use is all available on the Alarm Grid site! Why would you want to install your own security equipment? Well for one, a professional installer can charge hundreds or even thousands of dollars for a simple installation. It can also be somewhat unsettling to allow a stranger into your house, especially to work with something as sensitive and personal as your home security system. The truth is you - that's right, you - can install your own home alarm system just as well as a pro. And you can save money and learn about your system in the process. It doesn't get any better! 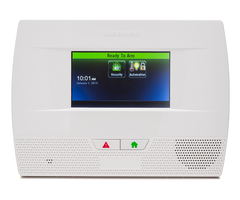 The panel that we recommend using for a DIY Honeywell Security System is the Honeywell Lyric Alarm System. This is the latest and most advanced security panel available from Honeywell. All of the sensors and equipment can be easily programmed with the system. The menus are easy to navigate and the process is extremely intuitive once you know what you're doing. The Lyric allows sensors to auto enroll with the system. This means you won't have to memorize or enter any long and confusing codes, and you will confirm for sure that the sensors have been recognized by the panel. Before you know it, you'll have your entire home set up and protected in a jiffy! We recommend using Honeywell SiX Series Sensors with the Honeywell Lyric Controller. These are all wireless sensors with a 200 foot nominal range. They feature 128-bit AES encryption for added protection and security when you need it most. Since these are wireless sensors, no wires need to be run. This makes the installation process super easy, even for beginners. When mounting the sensors, you don't even need to drill holes. Instead, you can just use double-sided foam tape. Slap the tape on the back of the sensor, plop the sensor on the wall, and boom, you're good to go! Some of the best Honeywell SiX Series Sensors for a home installation include Honeywell SiXMINICT Door Sensors, Honeywell SiXPIR Motion Sensors, Honeywell SiXGB Glass Break Sensors and Honeywell SiXSMOKE Smoke Detectors. As for the panel, you can mount it to the wall if you want. But for a DIY user, an easy option that requires no tools is to use a desk mount. The Lyric has a great desk mount just for this purpose. Simply slide the desk mount on the panel, and rest it on a table or desk for quick and easy access. There's no need to mount the panel to the wall, and you won't need to drill any holes. For connecting to the transformer, Honeywell offers the fantastic LT-Cable that eliminates the need to strip any wires. Simply screw the spaded ends to the transformer, connect the other end to the lyric, plug-in the barrel connector, and the setup is complete! With a user-friendly and convent Honeywell Home Security Systems, do it yourself is the name of the game! Why hire a professional installer when you can truly do it yourself? Not only can you achieve a great DIY installation, you can do it right! From there, you can customize your system to suit your home. 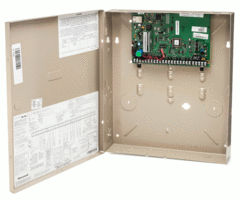 The Honeywell Lyric Alarm Control Panel is fully loaded, and it has everything you need to get started. A built-in WIFI card allows you to connect with the Honeywell AlarmNet Servers for use with the Total Connect 2.0 service. An integrated Z-Wave controller allows your set up smart home automation devices with ease. And iOS users will love the fact that the Lyric is compatible with the Apple HomeKit service for use with HomeKit smart scenes and automations. This HomeKit security system is perfect for those who want to expand upon their HomeKit setup. 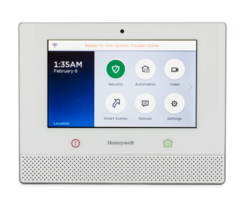 Once you have the Honeywell Lyric Security System, you just need an alarm monitoring plan to get started with professional and reliable home security. Alarm Grid can connect your home with three reliable central stations that operate 24/7. Our monitoring partner is Criticom Monitoring Services, which operates three central stations across the country in Florida, New Jersey and California. If one station is ever unavailable, the calls will be routed to a different central station for the ultimate reliability. This way, you and your family are always protected. Don't wait to get started! Email us at support@alarmgrid.com, or call us at (888) 818-7728 from 9am to 8pm EST M-F to receive monitoring service for your DIY Honeywell Home Security System! Honeywell Total Connect 2.0 December Update. What's new?! With Total connect 2.0's December update, Honeywell continues to take both end-user and dealer feedback seriously to improve the platform. In this release, there are improvements in loading speed, multiple changes to the way panel and Total Connect users are handled, as well as the reintroduction of the Night Stay Arming option in both Lyric and Lynx panels, and the addition of Custom Arming in the Lyric panels. Here's the splash screen for the December update. It outlines all the updates and improvements included with this release. This screen will come up when you first log in to the website after the update, but you can always access it from the About Screen in TC2 by following the "What's New in this app" link. This is also where you can provide feedback directly to Honeywell regarding the page. In the security screen, on Lyric and Lynx Touch panels, you now have the option to Arm Night Stay, if there are any interior zones on your system programmed with Night Stay enabled. On Lyric panels, you also have the option to choose Arm custom. When you do, you'll be presented with a screen showing all available zones. Any zones you select with a check mark will automatically be bypassed, with the rest being armed. You can choose whether or not you want the system to provide you with an Entry Delay, once armed. The panel will always provide an Exit Delay. Keep in mind that even though you may be bypassing all motion detectors, the panel considers this an "Away" arming, and will sound the Exit Delay beeps, if enabled. The panel does know the difference between arming via Total Connect 2.0, and arming via the keypad, so Auto Stay arming logic will not apply in this situation, as it would if you custom armed through the Lyric panel itself. Notification edits are now much easier to perform, and can be done directly from the Notification List page. You can still toggle a notification on or off quickly and easily, but you can also add a new notification Group from a drop down menu, and you can click on the name of the Notification Event to access an Edit screen, where you can change the name of the notification, shown as the subject of the notification message when it's received, add additional groups, then set those groups to also receive this notification, and so on. The Save option will only be available if information is changed on this screen. I'm glad to see Honeywell is taking input from both dealers and end-users seriously, and I look forward to seeing more improvements in the future. What do you think about the new features and improvements to Total Connect 2.0? What other changes would you like to see? Let us know in the comments section!